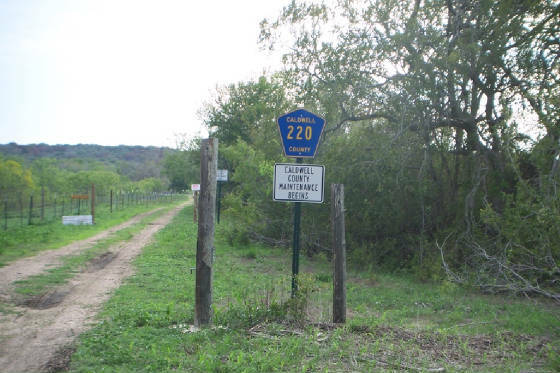 In Caldwell County, Texas, a small group of elected officials and local politicians ( now mostly ex- county and ex- city elected oficials also known AKA as "has-beens") have conspired for many years to build a 5-strand barbed-wire fence across County Road 220 inside the city limits of Lockhart, Texas, to block illegally the only ingress and egress of Frederick Wiegand Jr and his Wiegand family and workers, to Wiegand house and land down the county road to Clearfork Creek; and then make three grand juries to indict Frederick Wiegand Jr on various false bogus criminal charges, using false bogus perjured affidavits and testimony from the neighbor who are being paid while being black-mailed by the conspirators,with the criminal intent of illegally dispossessing Frederick Wiegand Jr of his inherited properties in Caldwell County, Texas, including the city of Lockhart, Texas. The one overt act of building a fence to block the public County Road 220 to Wiegand's house and land, is an obvious conspiratorial violation of the Texas Penal Code Chapter 42.03, the Texas Transportation Code, and other state and US federal laws prohibiting the illegal blocking of highways and passageways to a person's home and lands, and a most-obvious violation of "common laws". These criminal acts have been planned by several private business persons, and have convinced the public officials to use convicted criminals from Odessa,Texas, to steal from me, to commit perjury against me, and to bring false criminal charges against me. Therefore, I allege that those city of Lockhart officials Dan Gibson and Vance Rogers and county public officials former DA Richard Regan Trey Hicks III and former judge Tom Bonn and former judge Todd Blomerth are criminal accessories to the multiple unsolved thefts from my homes and lands in Lockhart and in Caldwell County, TX because the public officials and judges and law enforcement officials have obvious records of the criminal acts and criminal histories of those neighbors who are being used under the threat of re-jailing, to bring those false charges against me, and intimidate me with the three simultaneous lawsuits in Caldwell County, TX, to wrongfully dispossess me of my inherited and purchased properties. Royce Vickery, Texas Railroad Commission District One field inspector, attempted to criminally extort money from F. W. Wiegand, Jr. on his Merriwether Oil & Gas Lease in the Luling Oilfield, Caldwell County, TX, concerning small saltwater spills at the wellhead of the Merriwether natural gas well. Fred refused to pay, and reported Royce Vickery to the DA, but the Caldwell County DA did nothing about this complaint. So Fred figured that the DA was linked in to the extortion schemes by at least one TX RRC field inspector in Caldwell County, TX. The TRC permanently cancelled Fred's P1s and refused to permit him to sell his crudeoil in his tanks in TRC District 1, thereby putting Fred out of the oil and gas production business in Texas. The Caldwell County District Attorney's Office has ilegally refused for more than eight (8) years to produce the legal records that Wiegand has requested in writing many times, and CCAD has wrongfully increased the CCAD taxes about five ( 5 ) times for 2018, refusing to accept and approve his legal tax exemptions as !. disabled US Army combat veteran, 2. senior citizen over 65, and 3. homestead owner. Wiegand objects to these wrongful actions in legal methods and total lack of legal ethics and unethical abuse of family laws of TX, and has taken his appeal to the Supreme Court of Texas, and other federal legal authorities. The local thieves of the Feilder family have used the local judges to steal from my homes at 230 Wiegand Road and 1007 Cunningham Drive for many years. All my complaints to the Caldwell County Sheriff's Office and the City of Lockhart Police Departments have been rejected. Therefore, I consider those public institutions and officials as accessories to multiple thefts, attempted character assasination, and outrageous, totally unethical, and illegal conspiratorial distortion of local and state laws for the obvious purpose to ruin Frederick Wiegand Jr. and his Wiegand family. I continue to ask Federal authorities to apply the strictest federal criminal punishments to these accused political criminals in the city of Lockhart, in the County of Caldwell, and in the two Fiedler title opinion companies of Lockhart, Texas. 4 March 2019 update. I claim that all the title opinions on my lots, houses, and buildings in my ParkWay Subdivision in Lockhart, TX 78644, are clouded and void. Another reason for the continued disputes is the illegal shootings by the City of Lockhart and the Caldwell County Sheriff's Office of automatic machine-gun weapons within 500 yards of the Wiegand Ranchhouse. This complaint has been ignored by the city of Lockhart and the Caldwell County officials for several years, but is another reason that the local officials want to get rid of Frederick Wiegand Jr., one way ( supposedly legally ), or otherwise, like Carl Jonathan Wiegand, who completed disappeared on 10 March 2012. His website has been de-activated, but was www.helpfindcarl.com . His father Fred suspects that Carl was kidnapped and murdered, but no legal authority has found credible evidence of the crimes. Legal documents for the kidnapping and murder of Carl Jonathan Wiegand have been filed with federal authorities. Federal investigators should also review the complaints of the practice use by local authorities of automatic weapons, fire grenades, and machineguns, some of which are probably federally outlawed by the BATF and laws restricting the use of such deadly weapons, especially within 500 yard effective range of the Wiegand ranch house, clandestinely operated by the City of Lockhart and Caldwell County, whereby elected officials allow "their friends" to illegally shoot automatic weapons and hand grenades, outlawed by federal laws. This is a sworn complaint in Civil Case 2009-O-369 in the Texas District Court in the city of Lockhart, county of Caldwell, state of Texas, by Frederick Wiegand Jr. Telephone messages 512 938 7045. Todd Blomerth has been voted out of the office of Texas state judge by the voters of Caldwell County, Texas, and was removed from the bench in late January 2017. Extorsion is a crime of wrongfully taking land, properties, and other valuables from an innocent person, through criminal coersion and force by illegal threat.